On a crisp, cool morning this past Sunday, November 3, Tom Abbey, Veronica Calhoun, Kim Montini, Andy Shepard, and I rose early and made our way to the starting line of the 2013 ING NYC Marathon. After ferry rides and shuttle buses, our marathon team stood at the starting line of the greatest running race in the world for one important reason: to support a cure for hearing loss and tinnitus. Over the past several months we have spent hours on training runs, thanks to Abbey, team trainer from Functional Fitness VA, who prepared our team to tackle this great feat. Each team member also worked together to raise funds for HHF. In total, we raised nearly $20,000 to support a cure. "I would have never done it if it wasn't for the cause. And I'm so happy that I did," says Calhoun, who ran for her 4-year-old daughter, Marlowe, who was born with a hearing loss. All five team members crossed the finish line in their bright green HHF T-shirts, and we couldn't have felt happier about what we had just accomplished—not only completing 26.2 scenic miles through all five boroughs of New York City, but also knowing that journey is contributing to a cure for hearing loss and tinnitus. 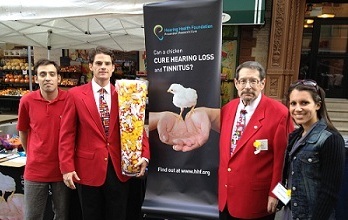 The accomplishment is something that goes much further than Marathon Sunday—something that, one day in the near future, will restore a vital sense to the nearly 50 million Americans with hearing loss. Interested in running in next year’s NYC Marathon for HHF? Email development@hhf.org today!